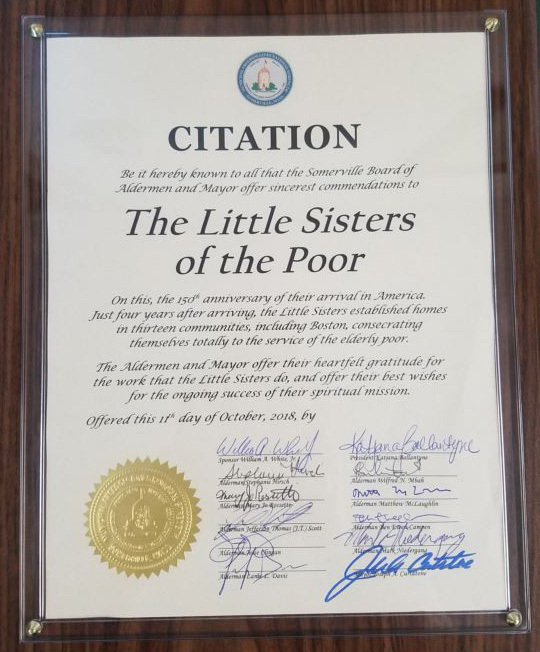 The planning of the important celebration of the Little Sisters of the Poor’s arrival in the U.S.A. began many months ago. Invitations were sent out to benefactors, families, and friends well in advance. It was decided early on to have the Eucharistic celebration at St. Catherine of Genoa Church on October 28 at 3 p.m. This Parish is just behind our own property here in Somerville. The Church was constructed between 1907 and 1920 and designed with the belief that the building should connect American immigrant Catholic aesthetic and spiritual experience. Much of the interior is made up of blended marble imported from Carrara, Italy. 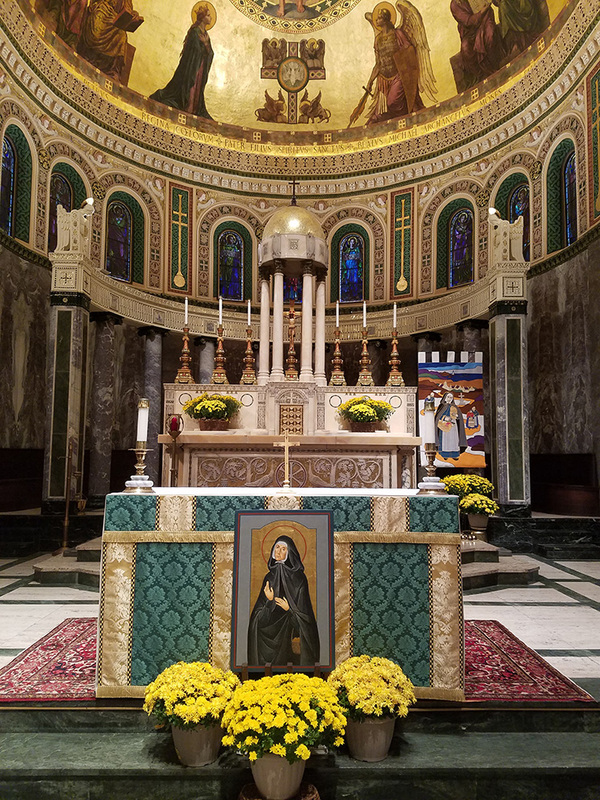 St. Catherine’s has been called the “gem of the Boston Archdiocese” because of its breathtaking beauty. 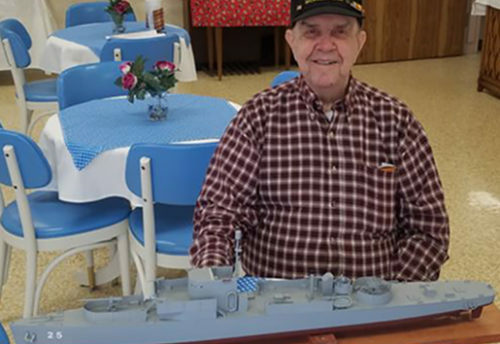 A week before the Mass, the local television station came to our Home for a tour, filming a segment for their station, and a few days later the Residents were happy to see themselves on T.V.! When the big day finally arrived, many of our Residents boarded our bus to make the trip around the block! By the start of Mass, the middle aisles of the Church were just about filled with nearly 300 people. A busload of Little Sisters, Residents, and friends also came from our Home in Pawtucket. Our Residents sat in the first few pews on the right and the Little Sisters processed in and sat up front on the left. Auxiliary Bishop Robert P. Reed was the main celebrant, assisted by our Chaplain, Fr. Pat Universal, Resident priest Fr. Joe Gaudet, our confessor Fr. Frank Conroy, and our priest friends, Fr. Richard Curran, Fr. Stephen Linehan, and Fr. Frank Campo. The First Reading was proclaimed by our Resident, Tom Hartigan, and the Second Reading was read by Lisa Scapellati, the mother of our Postulant Nicole. 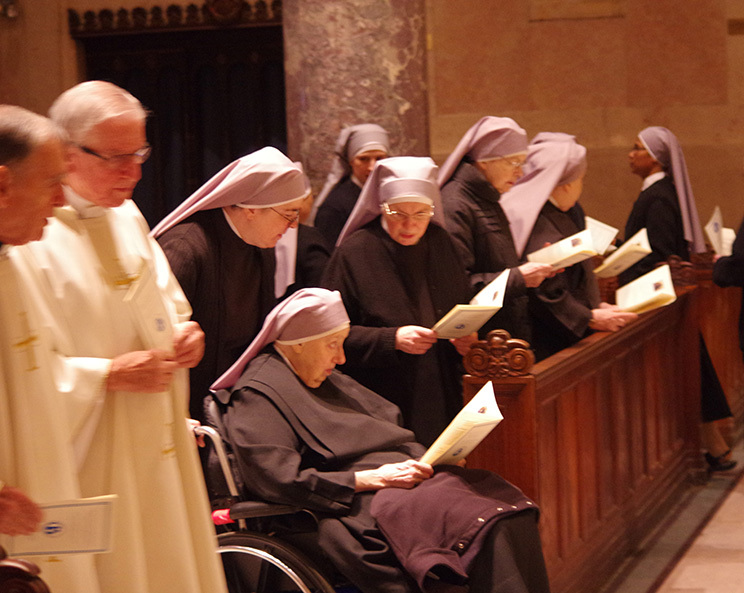 Sr. Mary John de la Croix read the Prayers of the Faithful. The Liturgy of the day was so appropriate as we raised our voices in song in response to the First Reading: “The Lord has done great things for us; we are filled with joy.” Bishop Reed spoke so beautifully in his homily. It was obvious how well he personally knows the Little Sisters and he spoke with warmth, encouraging us to be open to the Holy Spirit so as to continue living in today’s world the beautiful charism bequeathed to us by our mother, St. Jeanne Jugan. 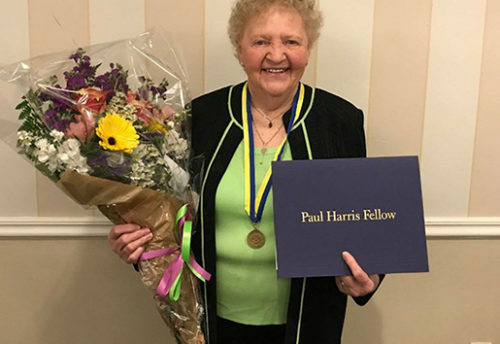 He began by noting that the presence of the Little Sisters has brought “amazing grace” into the lives of so many over the years, inspiring him to sing the hymn “Amazing Grace,” which prompted the entire assembly to spontaneously join their voices in song! 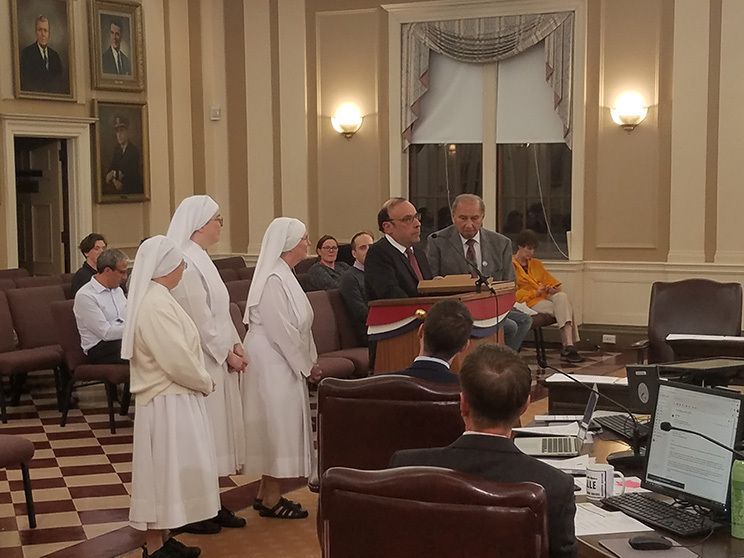 The Offertory gifts were presented by Somerville Mayor Emeritus Gene Brune, a great friend of the Little Sisters and new Chairman of our Advisory Board, a longtime Resident, Sheila Hurley, and a Little Sister, Sr. Lily de la Croix. 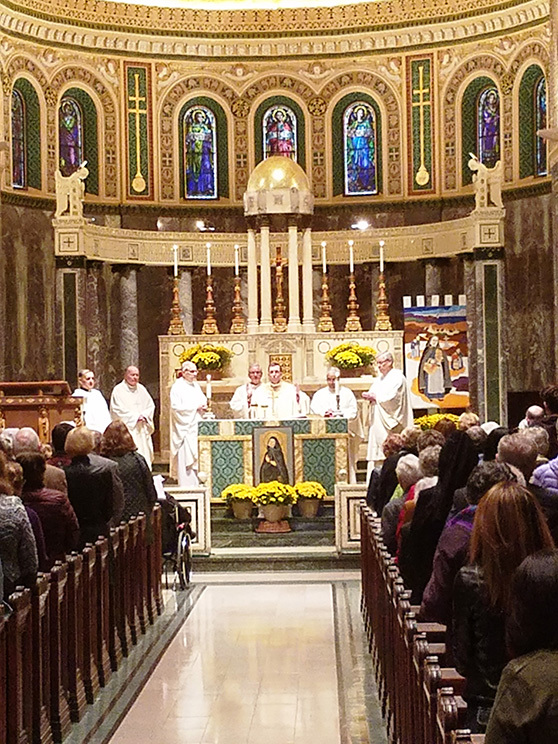 Led by Sr. Elizabeth Anne Mary, the music for the liturgy was well prepared and was accompanied on the organ by Peter Regan, the St. Catherine’s parish musician. The organ was complemented by a small group of musicians, made up of friends, family, and volunteers. Magdalena Richter, a world-renowned violinist and new volunteer, played the violin; Tim O’Brien, the husband of our Development Assistant, played the viola; Terry McGinty, the son of a Resident, played the trumpet; and Dave Leahy, the brother of Sr. Elizabeth Anne, played the electric guitar. It was magnificent! Guests even remarked that they were planning on bringing the program to their own parish musical directors to show them the wonderful music! At the end of the liturgical celebration, Mother Maureen offered a few words of thanks, mentioning the various groups who were there, which was followed by some applause. However, when she asked everyone to show their appreciation and love for our Residents, there was thunderous applause! It was very touching. She also gave a brief description of the tapestry that graced the sanctuary. 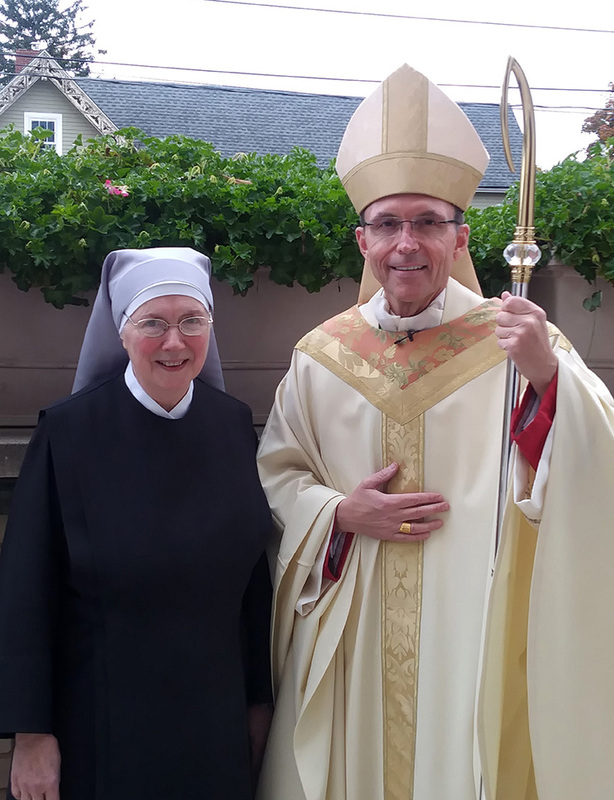 When she was leaving the podium, Bishop Reed came over and embraced her, symbolizing his love—and that of the Church—for the Little Sisters and our holy Mother, St. Jeanne Jugan. All joined their voices wholeheartedly in singing our Recessional hymn which was a solemn hymn of praise, the Te Deum in English! After the celebration everyone was invited to return to our Home for light refreshments and the guests filled the auditorium, which was decorated with white mums on the tables covered with blue tablecloths. There was a huge banner displayed over the stage with the words: “From a humble heart, a great wave of charity.” Everyone had the chance to admire the gorgeous banners and wonderful posters created by Sr. Constance Carolyn. It was a pleasant, informal gathering that gave us the chance to personally thank many of our friends and benefactors for all they do for us. 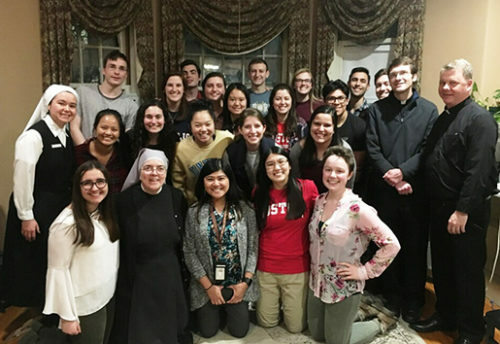 Tours of the Home were also offered during the reception, and our guests appreciated that the tours were given by a Little Sister, Sr. Patrice du Sacré Coeur, who was a wonderful tour guide. Only a few went on tours, because many who were here were very familiar with our home.